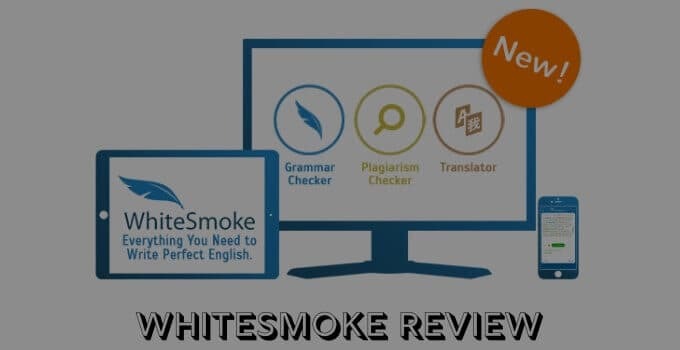 This WhiteSmoke review is updated in the March 2019 with every detail of this grammar checker software. In this detailed review of WhiteSmoke, we shared about the premium pricing plans, pros-cons, and features. Let's start reviewing WhiteSmoke. You must have heard this from your boss or your client when you submit the final copy of the article. 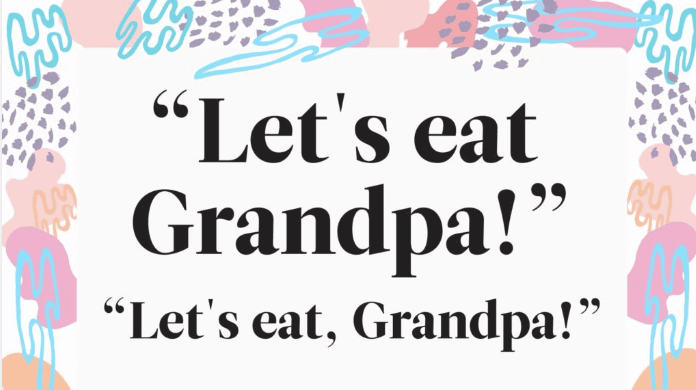 Grammar is crucial when it comes to writing high-quality articles. However, how can one solve the “your grammar is bad” problem? Well, you need an online proofreading tool like WhiteSmoke which helps you detect all the errors and resolve them. In this article, we will cover every detail of the software. Stay with us till the end until we uncover the entire software in our unbiased WhiteSmoke review. Where to Use the WhiteSmoke Software? Is Premium Version of WhiteSmoke Worth It? Can WhiteSmoke Beat A Human Proofreader? Is There Any Refund Policy With WhiteSmoke? Would I Recommend You WhiteSmoke Software? Q 1. How is WhiteSmoke Better Than Grammarly? Q 2. How to Use WhiteSmoke on Mac? Q 3. How to Remove WhiteSmoke from Computer? Q 4. How to Get WhiteSmoke for Free? Q 5. What is WhiteSmoke Translator? Q 6. How to Use WhiteSmoke Software? WhiteSmoke is an online proofreading tool that helps you in finding grammatical, punctuation and spelling errors in your article. The tool works in real-time and helps you find the mistakes instantly. The tool offers you a whole lot of benefits which we will see in detail below. WhiteSmoke is available in both Android & iOS mobile device so you can check grammatical and spelling errors on the go. With the paid plan of the software, you can correct errors in over 50 languages which gives you the ability to learn new languages while traveling. One of the main benefits of the WhiteSmoke software is the pre-built 100+ ready-made templates to create a perfect resume, email, documents, and letters. It saves you long hours of building a resume or letter from scratch. Whitesmoke isn’t just a proofreading software, but instead, they have an entire video library on explainer videos on the error you make in the article. You can learn from these videos and figure out the types of mistakes you make in your articles. Practicing this often will help you make fewer mistakes over time. In the web version of the software, you can check all the grammatical, punctuation and spelling errors in real-time as you write. You no longer need to copy paste your documents just start writing, and WhiteSmoke will take care of the rest. Read | 10 Best Proofreading Tools Online. Not only on mobile and web-based you can also use WhiteSmoke on your desktop. The same web-based version of the software will work on your desktop app with the help of the Internet. The desktop app will help you keep the software up and running in the background all day. I hope I was able to convince you about how useful WhiteSmoke software can be for your online business. However, that’s not all. I have more for you inside the box. Let’s talk about the features of the software and see how it can further help you. With the WhiteSmoke grammar checker, you cannot write wrong sentences even if you’d want to. The tool offers a variety of error suggestions like incomplete sentences, incorrect punctuations, double negatives, sentence fragments, missing words, dangling modifiers and much much more. If today you are not good at grammar and start to use the WhiteSmoke software after a couple of months you’ll see a massive improvement in your writing. Believe it or not, we all make spelling mistakes while writing the articles. Most of the times we don’t even know about the mistakes we make, and that’s when WhiteSmoke spell checker comes into play. 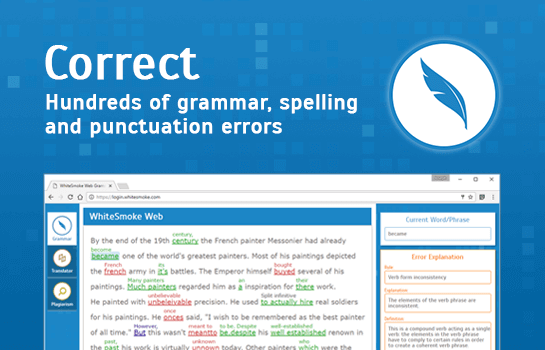 The tool actively checks all your spelling mistakes in real-time both in the desktop app and the web app. It would be weird if you have the perfect grammar but incorrect styling of sentences. Well, not anymore because with the WhiteSmoke style checker feature the tool suggests you new words and phrases keeping the sentence context intact. Existing WhiteSmoke users use this feature in law firms, universities, agencies, and other businesses. That is how important a punctuation mark is. If you don’t know where to put a colon, comma, hyphen or dash the software will guide you through it. The tool shows you error in identifying missing punctuations, quotation marks, periods, apostrophe and other punctuation errors. The tool highlights the mistake for you to recognize and solve it quickly. The WhiteSmoke translator is built on Statistical Machine Translation (SMT) which analyzes more than millions of translated text to give you the perfect translation of your text. You can use the translator on social media, blogs, SMB to connect with a new audience. Moreover, you can also sell it as a service to people who wants to translate their text and don’t know anything about a proofreading software. In this section of our in-depth WhiteSmoke review, we will break down all the aspects of the software and figure out what are the strong and weak points in WhiteSmoke. We will first start with the accuracy of the software. Although on copy pasting the article in the WhiteSmoke editor the tool did give a lot of error suggestions at the start. However, if you closely monitor the errors, you’ll notice that half of the mistakes suggested are lame and only make your sentences worse. We also noticed that while suggesting spelling errors the tool itself was showing us the wrong spelling which is disappointing considering they are in the industry from 2007. Overall, I’m not quite impressed with the accuracy of the WhiteSmoke software, and I give 6 out of 10 in accuracy. The user interface of the software is simple and easy to understand. However, after you copy paste the article and wish to change any paragraphs WhiteSmoke will not allow you to perform any changes in between I was shocked seeing this. Apart from that, the tool also doesn’t remember your text in the system so for any reason if you delete it without saving you have to perform the complete edit once again. I will give a 7 out of 10 just because of the simple user interface the software offers. The Internet is filled with negative comments on WhiteSmoke’s help & support team. WhiteSmoke takes several days sometimes even weeks to respond to your query; this can be painful when you need a solution to the problem instantly. The rating from my side is 5 out 10 rating for help & support of the software. There’s a big room here for the company to improve. The error suggestion of the software is minimal. Like Grammarly (read grammarly review here), you cannot scroll through the error suggestions. Instead, WhiteSmoke will show you a tooltip like the suggestion on your error. A couple of things which I like about the tool is, it has a decent plagiarism checker and a good translator. The text translated with the software is highly precise and ready to publish so thumbs up for that. Overall, I’d give 7 out of 10 in the editing and feedback section of the tool. All and all WhiteSmoke is an excellent software to try your hands on as it comes at a meager price and offers you almost all the features. No doubt, some of the error suggestions given by the software is lame, but that can be ignored considering the price you’re paying for the tool. WhiteSmoke is a cross-platform software and works with all the device that you have. The tool gives you the flexibility to check grammar on the go. For Android, the app is available for free on the Google Play store. After downloading the app login to your account and the tool will start to monitor all your errors from backend in real-time. For iOS users, you can download the app from App Store and start checking all your documents, emails, resumes and social media messages directly on your phone. For Desktop, the app works in the Windows OS, Mac OS and various other browsers like Chrome, Firefox, Safari, and Opera. Finally, you can also use WhiteSmoke in the web-version directly on their website. Login into your account, copy-paste the article and the tool will start to analyze all the errors. Starting at just $4.16/month the Essential plan is perfect for writers who are just starting their writing career and don’t have a dedicated budget to spend on a proofreading tool. Talking about the features, it comes with grammar and plagiarism checker and also the WhiteSmoke translator. The Premium plan starts at just $6.67/month offering you great features like grammar and plagiarism checker, translator, integration with other writing platforms and one-click instant proofreading. Apart from that, with the Premium plan you can use the software in MS Office, Gmail, all the browsers, Windows and Mac OS. The Premium plan is ideal for bloggers and professional freelance writers who are into writing business for quite some time now. The last plan is the Business plan which starts at just $11.50/month and provides everything from the Premium plan plus 3-computer license, extended download warranty, and phone call premium support. The plan is perfect for small to medium-sized agencies or businesses who produce content every day. Now that you know everything about the pricing structure of WhiteSmoke software let’s find out is it worth to spend your hard earned money on this software when you have hundreds of other options available in the market? WhiteSmoke is one of the cheapest alternatives to Grammarly & Ginger (read ginger review here). Moreover, the tool offers you top of the line features which you get in other proofreading software. Features like advanced grammar checker, desktop application, translation, styling and punctuation checks and most importantly 100+ readymade templates are difficult to get in under $5/month. Furthermore, WhiteSmoke also gives you access to their entire video library which you can use to learn and improve all your grammatical and punctuation errors. The only disappointing thing about WhiteSmoke is, they don’t give you any free plan to try out the tool. However, they do offer a full 4-day free trial to get your hand dirty and see if you find the tool ideal or not. Let’s see what some of the good and the bad points of WhiteSmoke software are. Spot all the errors quickly. 100+ ready templates to use directly. Support for Plagiarism Checker and Translator like features. Full video library to learn from your errors. Integrates with Outlook, Gmail and MS Office. In macOS, at times the software crashes. Sometimes paragraphs disappear after you click on Apply Changes. No doubt WhiteSmoke is a great software to check all your grammatical, punctuation and spelling mistakes. But does that mean it can replace a human proofreader? Well, not really! A professional human proofreader having years of experience reads your article can find out each and every mistake from the document. The software can never replace a human reader when it comes to proofreading. No doubt hiring a human proofreader can be way too expensive compared to tools like WhiteSmoke or Grammarly (You can also try the grammarly free trial version to check the features of this grammar checker.). However, it is proven that they’ll make your article 100% perfect in terms of grammar and other errors. If you’re a blogger or freelance content writer a tool like WhiteSmoke can do the job for you. However, if you’re an author who is looking to publish their new book in that case a proofreading tool won’t help as you need a professional human proofreader. Maybe in future tools like WhiteSmoke might replace a human proofreader but not at the time of writing this article. Yes, they do offer you refund policy. If you buy a monthly or yearly plan of WhiteSmoke and for some reason, you didn’t find the software useful in that case you can ask for a full refund. The refunds will only be entertained if you make a request in the first seven days on an active plan. After the 7th day, they won’t initiate the refund. For the plan, cancellation writes an email to billing@whitesmoke.com, and you should get your money back within 48 hrs of time span. I mean why not? It’s such a fantastic tool offered at a reasonably low price compared to its competitors. Plus, the tool has all the features that you need to make your articles perfect for publishing. If you write online and don’t have extra money to hire a VA to proofread your work, then yes, you need WhiteSmoke. Because, believe it or not, we all make mistakes while writing and if a tool can help us solve our writing mistake in a breeze we should have it, right? Many of you have several questions in mind after reading the full WhiteSmoke Review. Here I have gathered all the questions and compiled them in a list for you to refer. In terms of features, both the tools have an almost similar offering. However, when it comes to pricing WhiteSmoke leaves no room for Grammarly to compete. The premium plan of Grammarly starts at $29.95/mo whereas you get all those features in WhiteSmoke at just $6.67/mo. Step 1: First off, download the application in your Macbook. Step 2: Double click the .dmg file to start the installation and follow the onscreen instructions. Step 3: Finally, create a shortcut and launch the software. Step 1: Go to Start and search for Control Panel. Step 2: In Control Panel, search for WhiteSmoke. Step 3: Right-click on WhiteSmoke and click on Uninstall. Well, there’s no way you can get the WhiteSmoke software for free. The only way you can get the free version of the software is by trying out the 4-day free license. Once the period expires, you need to upgrade to their paid plan. 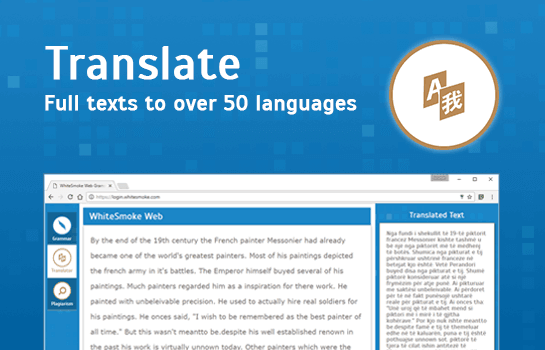 WhiteSmoke Translator is a feature which can translate your text into other languages. For instance, if you’re targeting both the English and French audience. In that case, with the help of WhiteSmoke Translator, you can convert English text to French and reach to a broader audience base. To use it on the web visit their website and start writing. The tool will check for errors in real-time. If you want to use it on your laptop download the native desktop app and repeat the process. Look, WhiteSmoke isn’t the first proofreading software available in the market there are hundreds of other tools. However, features like a readymade template, cheap price, and advanced grammar checks make WhiteSmoke a decent offering overall. I hope this detailed and unbiased WhiteSmoke review might have helped you in some way to understand more about this tool. If you found this article useful do consider sharing it with all your writing and blogging friends. Thanks for taking the time and reading the article.